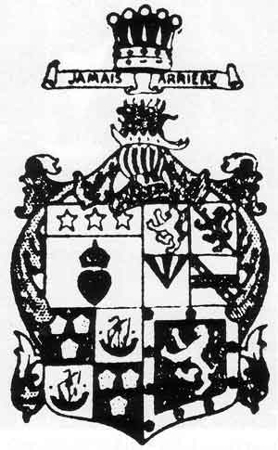 Thomas Douglas was born on St. Mary's Isle, Kirkcudbrightshire, as the seventh son of Helen Hamilton and Dunbar Douglas, 4th Earl of Selkirk. Although two of his brothers had died in infancy, Thomas had no initial prospect of inheriting his father's earldom. But between 1794 and 1797, all four of his remaining older brothers passed away - two of yellow fever in the Caribbean, and the other two of tuberculosis. When Dunbar died in 1799, the twenty-eight-year-old Thomas Douglas became the 5th Earl of Selkirk. Three events were critical in shaping Douglas's outlook and character: the first was a raid on St. Mary's Isle in 1778 by the American privateer John Paul Jones. Although the incident passed without bloodshed or brutality, the seven-year-old was shaken so badly that he developed a distaste for Americans that he admitted later to never wholly overcoming. The second deciding factor was his summer travels in the Highlands in 1792. As he witnessed first-hand devastating effects of the Clearances, his heart began to ache with sympathy for the displaced tenants and cotters. He viewed his destitute countrymen "not only with the artist's eye but with the mind of a moral philosopher and the calculation of an economist." 2 Douglas realized at once that emigration was an essential consequence to the permanent welfare of the kingdom, an unavoidable result of the general state of the country. At this point, however, he lacked the financial resources to put any relief plan he might have been formulating into action. After Douglas inherited his father's earldom, he found himself with sufficient wealth to assist the Highlanders that had been callously uprooted during the Clearances. He had been formulating a theory of emigration ever since his travels through the area, and his fortune gave him the opportunity to test it. 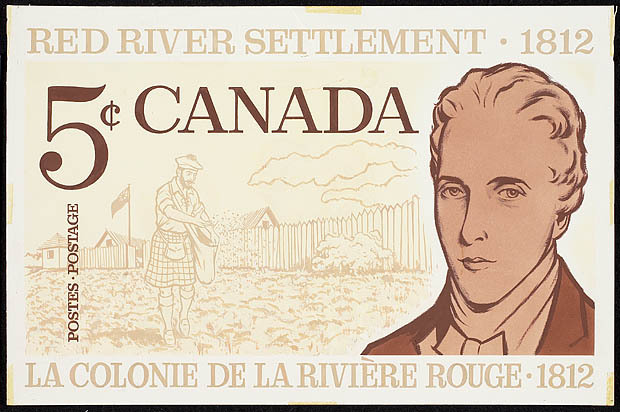 In 1802, Lord Selkirk approached the Colonial Office for a subsidized settlement grant in Sault-Sainte Marie, Upper Canada, with the hopes of establishing a settlement of Highlanders. While the Colonial Secretary was unsympathetic to the proposal, he hinted that he would give every consideration to a request for a land grant in Prince Edward Island. Selkirk wasted no time recruiting emigrants and contracting ships and supplies. In July 1803, the Dykes, the Polly, and the Oughton sailed across the Atlantic with eight hundred passengers collected mainly from the Isle of Skye. Despite troubles such as the lateness of the season, hindrances from the local government, and disputes among the settlers, the colony was an immediate success. By the time Selkirk left PEI in late September, his settlers had cleared their lands, built their houses, and were destined for happy success. Encouraged, Selkirk kept his plans for Upper Canada at the fore of his thoughts, and had decided to settle an area that he could support through his personal resources. He spent the next year traveling the interior of North America, undertaking an exhaustive study of the terrain, crop expectations, conditions of trade, and systems of local government. His most pressing concern was the degree and speed with which immigrants (especially Highlanders) adapted to their new homes, and concluded that they were better off in North America than their counterparts in Scotland. Selkirk named this new settlement Baldoon, after his ancestral homeland, and founded it near the junction of Lake St. Clair and the Detroit River. Although the fifteen families he brought over from Kirkcudbrightshire were initially optimistic, their hopes were soon smothered by malaria and drought. The planned community lasted just a little more than twenty years: by the 1820s, the settlers were moving to more promising lands elsewhere in the region. After completing his survey of Upper Canada in 1804, Selkirk returned to Scotland. He published a tract called Observations on the present state of the Highlands of Scotland, with a view of the causes and probable consequences of emigration (London, 1805), which advanced his theories on planned emigration despite opposition from the Royal Highland Agricultural Society of Scotland and the Colonial Office. 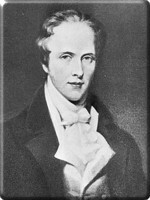 Selkirk had been made prominent by his rank and his wealth; the success of his book made him a celebrity. This new status enabled him to win election to the House of Lords in December 1806 as one of the sixteen peers representing Scotland. In office, he fought for the abolition of the slave trade, tackled the problem of national defense, and acted as a cautious voice of reason on Parliamentary reform, having been horrified by the excesses of the French Revolution. Selkirk spent the next few years enjoying the fruits of his labour. Shortly before his induction into the Royal Society of London, the Crown made him Lord Lieutenant of the Stewartry of Kirkcudbright. 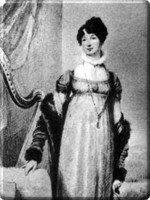 He won his greatest reward in 1807, when, at the age of thirty-six, he married Jean Wedderburn-Colvile, a bright, attractive girl fifteen years his junior. She consoled him in his times of troubles and proved an invaluable supporter, the source of his greatest happiness. The marriage also came with a useful ally: Andrew, Jean's brother, was on the board of the Hudson's Bay Company, as was her cousin, John Halkett, who later married Selkirk's sister. Despite the failure of the Baldoon settlement, Selkirk remained inspired by the success of the Prince Edward Island settlers and never lost faith that emigration was the solution to Scotland's problems. Before choosing Upper Canada as the site of experimentation, his first choice had been Red River; getting a land grant in that area, however, had been impossible, as that territory was under the control of the Hudson's Bay Company. But when the Napoleonic Wars broke out, demand for fur in the European markets plummeted; and with that came a devaluation of HBC shares. 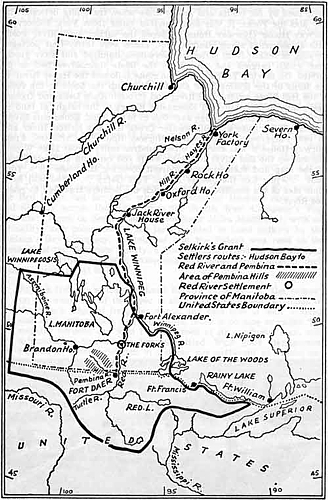 This revived Selkirk's hope of colonizing the Red River, a viable option if he could secure an interest in the company. Andrew Wedderburn, Selkirk's brother-in-law, was promoted to the HBC's governing committee around July 1808, the same time Selkirk began buying HBC shares. The next year, Wedderburn and Halkett took advantage of the stock's attractive price, thus giving Selkirk and his allies a strong voice in the company. Thus in 1811, Selkirk put forward his proposal to create a settlement in the Red River area. The HBC agreed to grant him three hundred thousand square kilometers of land in what is now Manitoba, North Dakota, and Minnesota. In exchange for this concession, Selkirk was to provide the company with two hundred employees per year, allow it to set up trading posts in the colony's territory, provide land for retired HBC employees, and forbid colonists from taking part in the fur trade. For a price of ten shillings, Lord Selkirk purchased the fertile mass of land five times the size of Scotland. 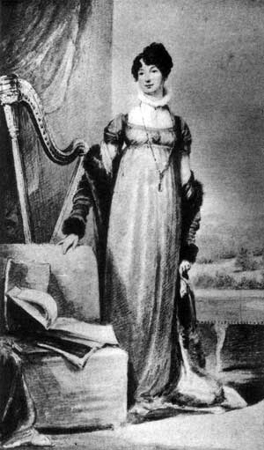 Lady Selkirk would later refer bitterly to the area as her husband's Kingdom of Red River. The Red River colony, unfortunately, was born under a star unluckier than Baldoon's. For the next ten years, the land would be the focus of a bloody struggle between the two titans of the fur trade, the Hudson's Bay Company and the North West Company, whose trade routes went right through the heart of the newly-granted settlement. In less than a decade, the conflict would bankrupt the Earl of Selkirk and contribute to his early death. Selkirk chose Miles MacDonell, brother-in-law of Baldoon manager Alexander McDonell and newly-appointed first Governor of Assiniboia, as the superintendent of the Red River operations. MacDonell and a party of thirty-five Scots and Irish workmen arrived at the chosen site on 30 August, 1812 to prepare for the settlers. Pleased to find fertile land, a healthy climate, and an abundance of fish and buffalo, MacDonell wrote to Selkirk, "The country exceeds any idea I had formed of its goodness, I am only astonished it has lain so long unsettled." 4 The party then built Fort Douglas in preparation for the one hundred twenty settlers that would arrive in the spring of 1814 from the Hebrides. They had paid ten pounds sterling each in return for their transportation from Scotland to Red River, one hundred acres of land at a rate of five shillings per acre, and a year's supply of provisions. Unfortunately, the influx of settlers into Fort Douglas only meant that there were more mouths to feed from a small ration of food following a failed crop. In response to the near-famine conditions that ensued, MacDonell forbade the export of pemmican, a long-lasting mixture of dried pulverized buffalo meat, dried berries, and rendered animal fat, from the colony. Aside from the new settlers at Fort Douglas, the Red River area was populated mostly by M�tis Indians, who made a living by selling pemmican to North West Company fur traders. Supported by the NWC, which accused the HBC of unlawfully restricting Indian trade to monopolize the fur industry, the M�tis regarded MacDonell's measure as a declaration of war. When Selkirk heard that the North West Company was rousing the natives against his settlement, he asked the Colonial Office for protection and left Scotland to visit the colony himself. The government, however, refused to support him, and when he landed in New York in October 1815, he heard that the Red River settlement had been destroyed. The M�tis had run the settlers out of Fort Douglas - thirteen families consisting of about sixty people - burning down their crops and homes. MacDonell himself was arrested on a dubious warrant and taken as a prisoner to Lower Canada. As Selkirk prepared to go to Red River from Montreal, a messenger came in March 1816 with news from the colony. Jean-Baptiste Lagimoniere had traveled 1,800 miles in the depth of winter to report that the settlers had returned to Fort Douglas, determined to survive. 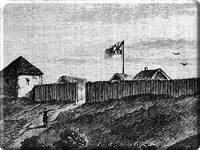 Moreover, Lagimoniere reported, the new Assiniboian governor, Robert Semple, had strengthened it with another batch of eighty-five Scottish settlers and had burned down Fort Gibraltar, the Red River stronghold of the North West Company. Selkirk recruited one hundred and forty men from the disbanded De Meuron's Regiment to accompany him and his party to Fort Douglas. 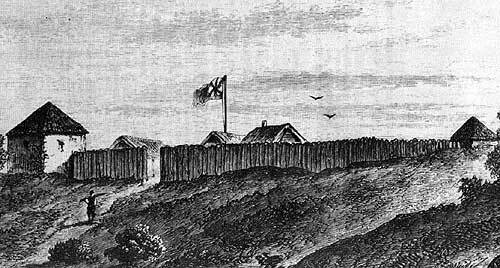 In exchange for serving in a military capacity if the fort needed protection, Selkirk granted the "soldier-settlers" tracts of land, disobeying the Canadian government's prohibition on sending military forces into Indian Territory. The North West Company beat Selkirk's party to Fort Douglas. At Sault-Sainte Marie in July 1816, Selkirk learned that the M�tis, under the command of Cuthbert Grant, had attacked the colony a second time in retaliation for the destruction of Fort Gibraltar. Twenty colonists plus Governor Semple had been killed in the Battle of Seven Oaks, while a few others were being held prisoner at the NWC's Fort William in Thunder Bay, Ontario. The rest had been driven away. Selkirk retaliated by marching his forces straight to Fort William, where he (having the powers of a justice of the peace) arrested nine North West Company partners for the deaths of his colonists, sent them as prisoners to Sandwich (Windsor), impounded their furs, and occupied the fort for the winter. While stationed there, a constable arrived from Upper Canada to arrest him for having unjustly arrested the NWC partners; Selkirk compounded his offense by having his militiamen lock up the constable when he tried to use force against the earl. Selkirk left Fort William intact on the first of May, 1817, to continue to Red River. The party was able to retake Fort Douglas without any bloodshed while the settlers, who had been camping some miles downriver since their expulsion from the fort, returned to their land. 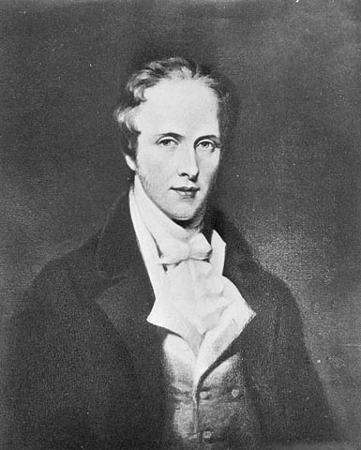 Lord Selkirk made plans for roads, bridges, mills, an experimental farm, and set aside land for a school and church, promising the colony that he would soon be sending a Gaelic-speaking Presbyterian minister. With Red River secured, the earl began the journey back to Scotland. The North West Company would not be defeated so easily. While Selkirk was in Red River, the nine acquitted NWC directors filed charges from Sandwich against Selkirk for his actions at Fort William. Lord Selkirk answered the warrant for his arrest and found himself "hopelessly entangled in a web of perjury, postponements, and manipulation" 5 by NWC partners. Although the judge lowered his bail to two-hundred-fifty pounds down from six thousand pounds, Selkirk was shaken to his very core by the miscarriage of justice during his proceedings. His health, robust during the previous year of rigorous travel, waned during the months of legal delay. After a mistrial was declared at Sandwich early in 1818, Selkirk proceeded to Montreal, where Chief Justice William Dummer Powell adjourned the case indefinitely. Selkirk, whose lawyer had believed that an acquittal was pending, learned at the same time that he had not been elected as a Scottish peer for the first time since 1806. Fed up with Canadian justice, Selkirk sought retribution at the Colonial Office in London. Though he was seriously ill by the time he made it back to Britain, he continued to fight from his sick-bed. He detailed the whole miserable controversy in A Letter to the Earl of Liverpool, published 1819, while continuing to monitor the affairs of his Prince Edward Island and Red River settlements, using the little money he had left to forward supplies to them. While his health seemed to improve for a bit, the enormous stress that had been bubbling for the past several years finally culminated in a hemorrhage. When he was vindicated by his brother-in-law's exposure of the North West Company's illegal trading methods to Parliament in the spring of 1819, Selkirk was too weak to follow up.